The Airships – Officers, Crew and Magi-Bots work together to outmaneuver, outgun and outfight the enemy. The Turbulent Skies – An oddball fantasy world where storms and monsters, or odder happenings such as Spook attacks, can both hinder or assist a skirmishing airship. The game is on! – A head to head airship showdown where your choices, tactics and luck will see you victorious. Anywhere! Because oddball Aeronauts doesn't require a surface to play on it can literally be played anywhere! On a train, in the school yard, in a convention queue, in the college library (get back to your books you! ), between gaming sessions - these are all very good and highly commendable places and circumstances for playing the game. Briefly: oddball Aeronauts is a light strategy, fast card game. Pick a Skill. Decide how many cards to play. Compare with your opponent to determine the result. Use special abilities to swing things your way where you can. You win the game when your opponent has discarded all their cards. What could be simpler? It ain't rocket science! Well, actually there is an argument for that possibility! Rick Royal gives an overview of the game, and goes through a game using the prototype cards. Rahdo gives a gameplay overview. OK so I’m coming a tad late to this party, in actual fact its a shocking oversight as the designers are local lads. Stop with the looks back there, OK the truth of the matter is I missed the original Kickstarter and fully intended to catch up with Nigel and Lloyd at the UK Games Expo, but of course their stand was always busy so I never had the chance. Cue lots of shiny new games between that to muddy the waters further and so time passes Thorin sings about gold etc. Spin forward to now and I’ve managed to right a great many of these wrongs, I have now made first contact with the Pyne brothers the symbiotic organism responsible for oddball’s and managed to play the game with them, bolstered by that experience I subsequently purchased it. See. Happy Now! So what is all this oddball Aeronauts business anyway? I’d original been drawn in by the cool art and just the overall look of the game there was something intriguing which I couldn’t quite get a handle on. On its release many fellow reviewers and podcasters were bigging this up, heck there was even some slavering, i’m sure I saw some slaver. I’d kept quiet obviously, admitting to having missed the airboat would have made me terribly uncool. 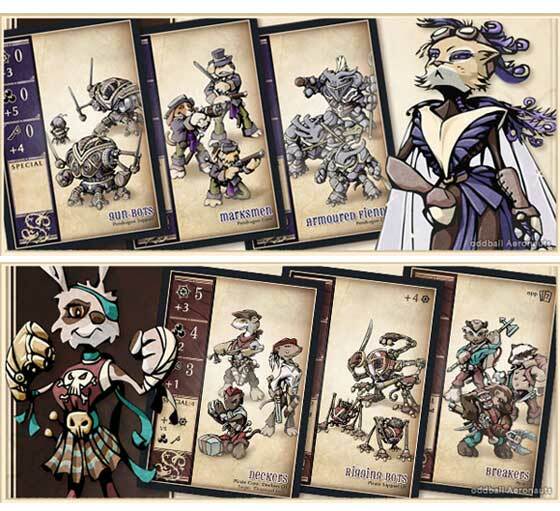 So oddball’s is actually a pretty simple little card game set in a kooky steampunk universe where bands of critters pilot great floating airships and battle it out upon the very high seas. It does a simple little bit of sleight of hand, it takes that old staple of school yard playtime Top Trumps, a game I personally sunk numerous hours playing my old Horror deck and then fixes all its issues. Gone are the marathon play sessions where you wish the world would just end and swallow you up, the endless clip art and themeless game play and in comes a story and art working alongside the clever idea of not requiring a play surface to get a game going. This is something that you can pull out of a bag and get to playing anywhere with anyone. It improves upon the pick a stat and compare by offering a few simple modifiers to the cards that will reward playing a certain power or type of card allowing for you to create some clever little combo’s. And the fact you can stack the stats from the top three cards to boost your score takes away the simple my number versus your number monotonousness play of Trumps. This is a game of attrition as your deck slowly dwindles either through playing cards or the effects of losing a trick (a hand) which is also the in game timer counting down to your inevitable defeat. The three skills that you play and compare each round have ramifications allowing for some subtle tactics and choices to occur. Boarding – Winner recovers 1 card and loser discards 1. And its as easy as that, the skill comes in planning ahead and using those combo’s. Do you sacrifice a win this round knowing that you’ll lose the cards that will allow you to get to the sweet ones below, do you gamble on what your opponent will play or even how many cards to hit a sweet combo. There’s a little of a lot to think about each round, enough so that your always making a decision each round but not too much that you’ll fall into some AP coma. Its a simple game and is gently marred by a few issues, there is the inevitable confusion in the first few plays, the rule book could be better I was helped tremendously by having the designers on hand to teach me so I didn’t need it, this is a feature that should be worked into all future games, somebody get on that right away. It also comes with a active player marker that kind of goes against the whole philosophy of the surfaceless requirement to play, we got around this by using it to bounce off the losing opponents forehead to really rub in that defeat and that works just fine. There are enough extra mercenary cards that once you’ve mastered the base decks you can mix in a few of these more powerful ones to spice up the proceedings and offers a tantalizing glimpse of where this game may go. All in all if your looking for a simple and portable little game that looks great in your mits while offering that espresso hit of game than this is what we have here. oddball Aeronauts, a game by maverick:muse (Nigel and Lloyd Ash Pyne), has been billed as a tableless game and that’s completely true, but I would also call it a perfect game for Google+. Right now the game is a two player game, but with the latest stand-alone expansion (on Kickstarter until December 5th 2014) it brings it up to a four player game. Each player takes control of a different faction and fights to the death of the others! Each faction has their own set of cards that are unique to them so as long as you and the other players own the game you can all choose different factions and be all set. The game plays relatively simple, but behind the simple play, lies a deeper strategy. During the game each player announces their type of attack (sailing, boarding, guns) and then secretly decides on how many of the top three cards they will use to attack the other players. Once both players decide there is a reveal and the attack values are added up. Tricks (special abilities of the cards) can be played to aid you in your win, or loss and magic can be played to help increase your attack value. To the victor goes the spoils, causing the other player to lose more cards and/or gaining cards back depending on the attack type. Over Skype/Google Hangouts, this game essentially runs no differently than it would face to face. The only difference would be in the delay of the reveal due to the video being sent to space before coming back to your computer. That is negligible though. This game works very well online and doesn’t require anything extra on the part of the host of the game which is even better. You can fight it out oddball style with people from across the world as if they were in your living room. 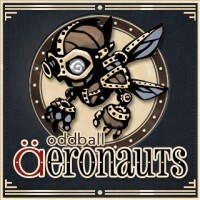 Add a Review for "oddball Aeronauts"